The Village of Old Deerfield, Massachusetts is the home site of “New England’s Most Beautiful Craft Fair!” As a juried craft fair, the Old Deerfield Craft Fair selects its exhibitors for their quality. The wonderful variety of crafts includes quilts, baskets, wood carvings, pottery, dolls, dried flower arrangements, teddy bears, decoys, tin, theorem, stenciling, jewelry and more! The Old Deerfield Craft Fairshave been among the highest ranked shows in Massachusetts and New England by Sunshine Artist Magazine, for 25 years a major publication of the arts and crafts movement in the United States. 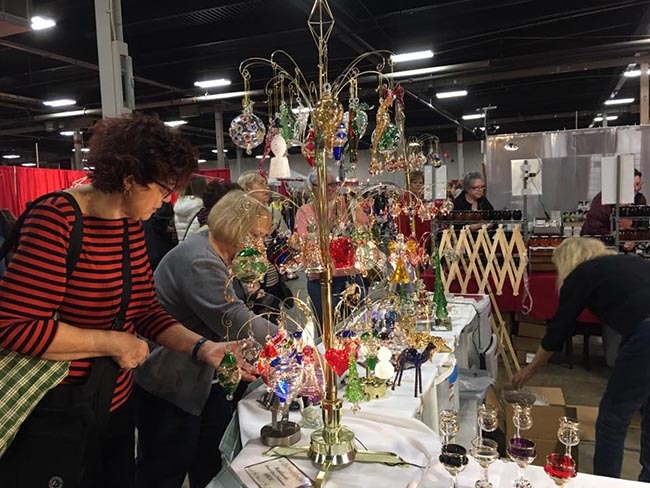 The Christmas Sampler, Fall Craft Fair, and Summer Craft Fair were each recognized in the “Best Show”rankings, with the Sampler holding the #1 spot for Traditional Craft Fairs in New England. The first-rate selection of artisans, charming location and other attractions has earned the Old Deerfield Craft Fair prestigious accolades. Yankee Magazine has named the craft fair as one of the top 20 events in New England and as the top 3 in Massachusetts! Sunshine Artist Magazine, a leading publication for the arts and crafts movement in the United States, has also ranked the Old Deerfield Fall Craft Fairs among the best for many years.